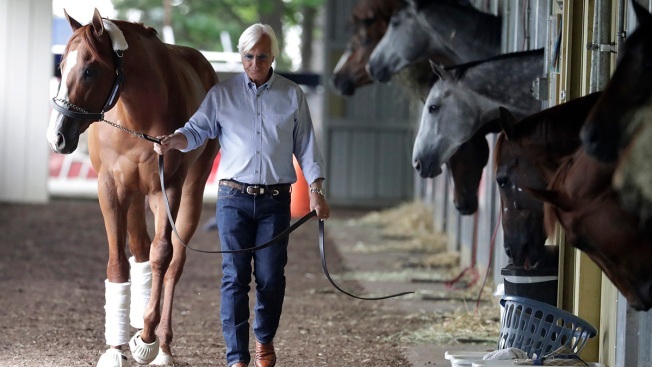 Trainer Bob Baffert walks Justify, after the Triple Crown hopeful arrived at Belmont Park in Elmont, N.Y., June 6, 2018. 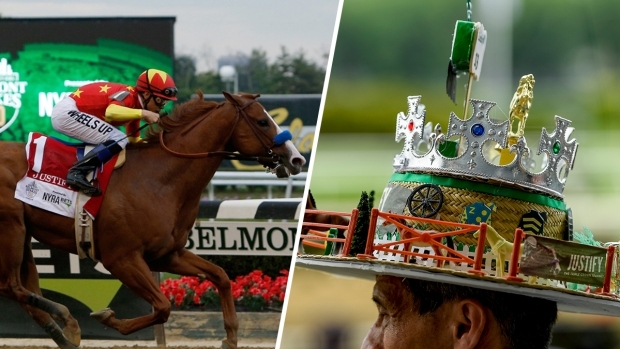 If the process were simple, there would be a lot more big-time trainers in thoroughbred racing. It's tough to break into the game and even tougher to break through to the upper echelon. Owners want the top trainers, so conditioners such as future Hall of Famer Todd Pletcher and current Hall members Bob Baffert, D. Wayne Lukas, Bill Mott and Steve Asmussen get more inquiries than they can keep track of and have the luxury of choosing their spots. "They've trained the best horses, start with the best horses and they've earned the right to do it," said trainer Dale Romans, whose colt Keen Ice upset 2015 Triple Crown winner American Pharoah that summer in the Travers Stakes. "Obviously, they'll be at the big events more than others and they're all worthy. But there are a lot of good trainers that with the right horse they can win the big one." Trainers eagerly watch yearling sales with a keen eye on champion bloodlines. From there, it's the process of following gut instincts about a horse's potential and creating a strategy for development. "The attitude is stay humble or be humbled," said Asmussen, 52. "It's an incredibly humbling game, but tomorrow if you're in there you still have the same chance because they're not going to put you behind the gates because you had a bad day yesterday." Chad Brown is considered horse racing's next great trainer — if the two Eclipse Awards in his possession, basically "trainer of the year" trophies, haven't shown that he's there already. Wisely choosing horses has been the key to success for Brown, who credits his rise to "having experience in big-race situations" and a good staff. 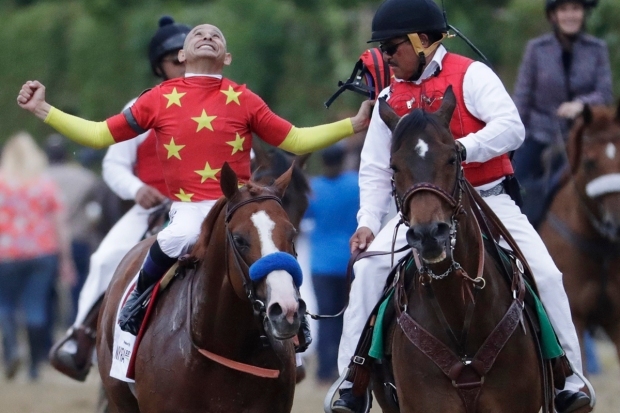 "You try to stay focused," said the 39-year-old Brown, who has a chance to derail Justify's Triple Crown bid if Gronkowski — named for the New England tight end Rob Gronkowski — wins Saturday's Belmont Stakes. "Being the leader of a team, you try to make the right decision." "All of them have done so well that it really makes me feel good that we gave them a foundation to put them in that position," Lukas, 82, said. "Todd is obviously No. 1 there." Besides winning the Eclipse Award seven times, Pletcher has established a reputation for strength in numbers when it comes to graded stakes contenders. He had four horses in this year's Kentucky Derby. The Belmont will pit Pletcher against Jack Wolf, his Starlight Racing boss who's part of Justify's large ownership group. That potential conflict doesn't bother Wolf, who has known Pletcher for 17 years and hired him to train his horses but is mindful of the demands for his talents. "At the time I had only been in business for a year and had some nice horses," Wolf said. "I thought employing Todd as a trainer because he would get the most out of them. "As far as the numbers they train, in Todd's case it's a benefit because he has very competent assistants. As good a manager as Todd is, I think it's a positive, not a negative." Justify is the 4-5 favorite but could be pushed by Mott's entry Hofburg (9-2), Vino Rosso and Lukas pupil Bravazo (both 8-1). He's right: It is a who's-who of trainers. The Belmont field has trainers like Asmussen (Tenfold), stakes-winning veteran Doug O'Neill (Blended Citizen), Romans (Free Drop Billy) and Brown. "That in itself makes it dandy," said Lukas, a winner of more than 4,800 races. "You've got guys that have been there, done that and the whole experience is such a challenge."